Due to playing a couple of live tournaments and my birthday and such things, I've played a rather meagre amount of poker online over the last few days. In 5 days of play I've only managed 2,200 hands. Took a little hit to my actual profit, but covered it with rakeback, so I'm not much better off than I was this time last week! Really need to try and play more. I wish there was a little bit more traffic on Boss. I try my best to table select and sometimes that means I'm only playing 1 or 2 tables if a lot of regulars are around. When I get my rakeback paid at the end of the month, I might try having a roll somewhere else for when the traffic is bad. 3 Comments to "LHE Challenge: Days 11-15"
I see that you link to many pokerblogs, and some of have not been updated in a very long time. 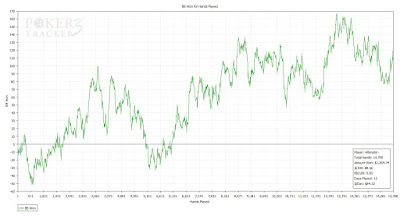 So i wondered if you would mind linking to The Pokerstar Blog ?